Old Bull's Head Inn II Public House, probably built as dwelling. Core probably early C17, re-fronted early C19. Stucco over brick with plain tiled roof. 2-storeyed, 3-unit plan, with one unit to right of doorway, in moulded case. Casement windows of 3 lights. Gable and axial stacks. Inside, a heavily moulded bressumer beam over fireplace, and chamfered ceiling beams survive from the earlier structure. 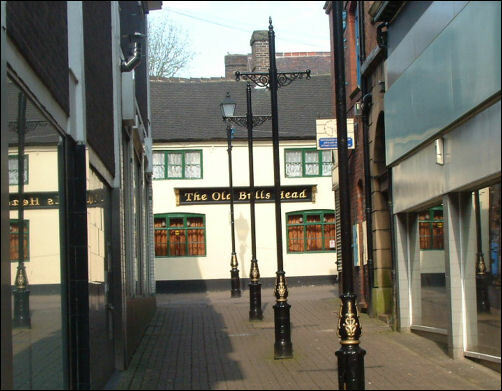 "There appears to be friendly rivalry between two pubs in Newcastle as to which is the older. 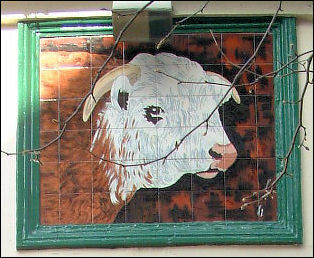 The Bull's Head, in Lad Lane, which now has a stuccoed front concealing the original 17th century timbers, claims the honour, although many contend that it should go to the Old Star, in the Ironmarket, now called the Super Star, and greatly altered from its original half-timbering. Many of the older buildings that were inns have either been demolished or taken over by other businesses. Recently demolished buildings include the Market Hotel, which was occupied by Woolworths before they built their present store on the same site; the Three Tuns, at the top of Church Street, established in 1793 in an older building, and later a chemist's, before being demolished in the 1950s; and Hind's Vaults in Lad Lane. 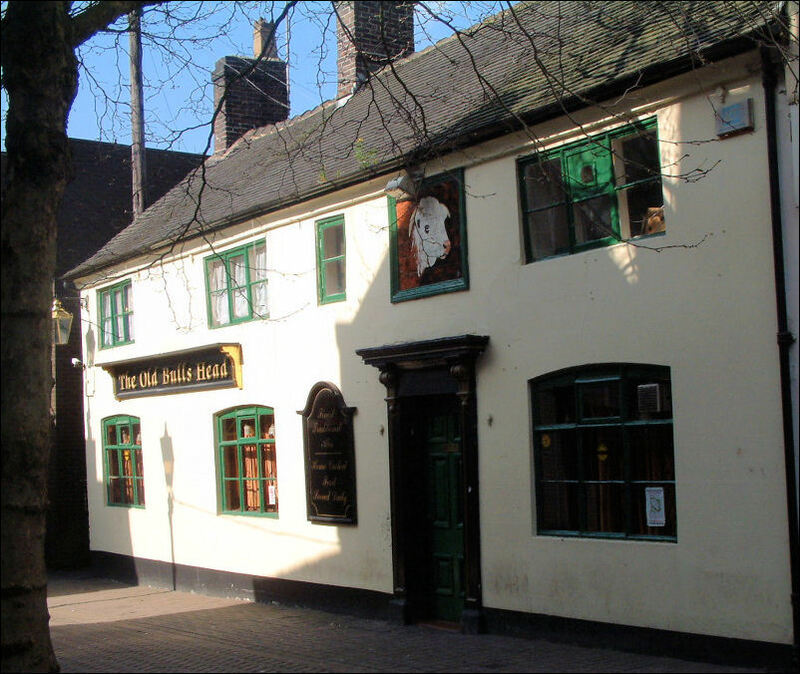 Among those that have managed to survive are the much restored Wine Vaults; the former Golden Ball in Bridge Street, which is now a butcher's shop and the only building to retain its original 17th century half-timbered front; and, of course, there is the former Castle Hotel. 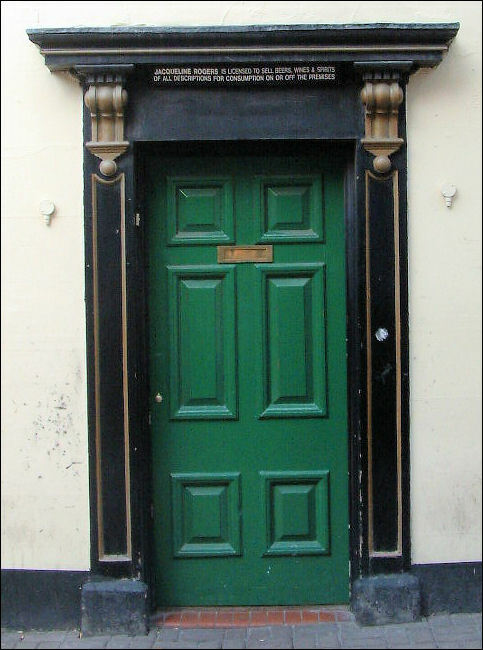 It was after the completion of the main turnpike road between Manchester and London in 1750 that Newcastle developed into an important coaching town, with many hostels and inns becoming important posting houses. Frequent services to London and other major towns were introduced, and distances of 60 miles per day covered during summer and 30 in winter. 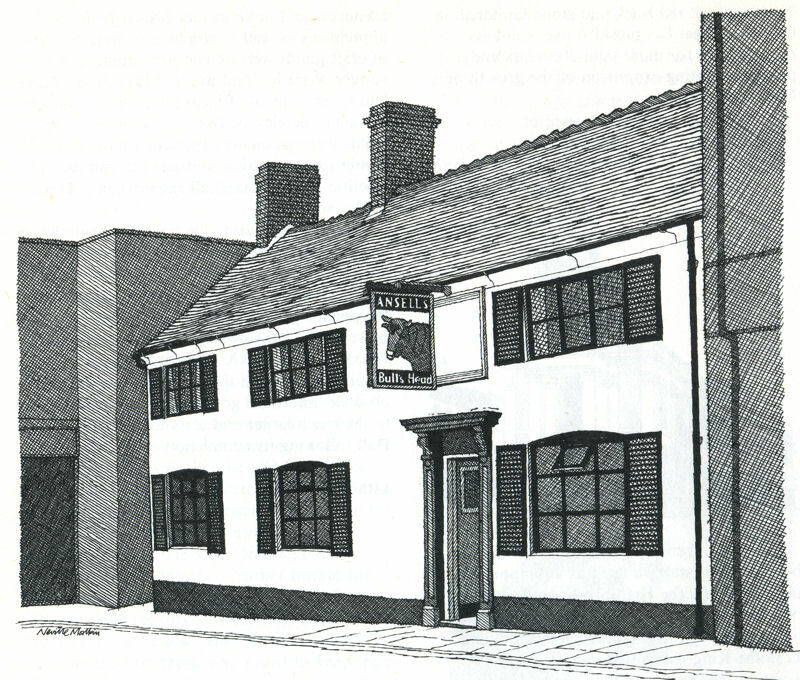 Towards the end of the 18th century, coaches such as the Derby Fly carried passengers from Newcastle to Derby, Nottingham and Lincoln; inns that became important posting houses included the Roebuck and Talbot in High Street, the King's Head in Penkhull Street, and the Woolpack in Red Lion Square. By 1818, there were more than 40 coaches a day using the town. Ten daily coaches went to London, including the Royal Mail, four to Birmingham, four to Manchester and six to Liverpool. In 1834, when coaching was at its peak, services had increased tremendously, and the Castle Hotel, Three Tuns and the Globe had been added to the list of posting houses; coaches with such names as the Bang-up, the Eclipse and Expedition became familiar sights. But, with the opening of the Grand Junction Railway in 1837, the need for coaches rapidly declined, and Newcastle, along with its many hotels and inns, suffered greatly from the demise of a very healthy passing trade."